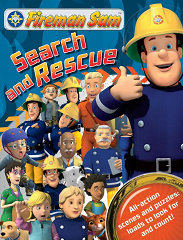 Fireman Sam Episodes And Search & Rescue Activity Book Giveaway! Fine Print: I was not compensated for this post. Hit Company and Amazon are giving one lucky reader a book. All opinions and statements below are my own. If you’re looking for a new show for your kids, this might be it! HIT Entertainment, one of the world’s leading preschool entertainment companies and a division of Fisher-Price has announced that Amazon will be the exclusive U.S. home to the popular preschool franchise Fireman Sam! Fireman Sam Season 1 episodes are currently available to stream or download in Amazon Instant Video, Prime Instant Video, and FreeTime Unlimited beginning today, so check it out! And as a bonus, these will all be free if you have Amazon Prime! In addition to TV episodes, Fireman Sam eBooks are also available! You can expect to see other apparel from toys to lunch boxes on sale a little later this year, so be sure to keep these in mind for the holidays! To get everyone excited about Fireman Sam, I am giving one lucky winner a Fireman Sam Search & Rescue Activity Book! To enter this giveaway, complete any or all of the options listed below. Giveaway ends 8/22. Good luck! My 2 year old loves Fireman Sam! Curious George is one of our favorites! My son was getting into Fireman Sam but then they took it off Netflix. 🙁 Hopefully they bring it back! Right now Peppa Pig is my grandson’s favorite, but he loves Fireman Sam, too! My son likes Word Girl right now. My kids like anything LEGO based, especially Ninjago. Bubble Guppies and Peppa Pig are some of their favorites. I think his favorite is Peppa the Pig. My little niece and nephew will love this!